Stand and Deliver: Baby #4 is on its way! It's coming some time in March! 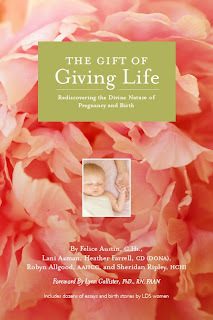 I've been involved with this book project since the 2009 Lamaze conference in Orlando, where I met two LDS childbirth educators: Beth Day and Katy Rawlins. We talked about the intersection of LDS spirituality and birth and agreed that someone needed to write a book about it. When we returned home, we connected with Felice Austin and other women, and eventually this book project was conceived. My favorite part of the book are the incredible stories we received from hundreds of LDS women. We received so many stories that we could only accept a portion of them; imagine how difficult that task was! To get a feel for the book's content, you can read The Gift of Giving Life blog. You can also read excerpts of the book here. This book would be perfect for LDS women and families in their childbearing years. The book's release date is scheduled for March. In the meantime, the publisher is accepting discounted pre-sales here. If you order now, you can save 10% off the list price. Congratulations! What a beautiful cover, too! You freaked me out with the title! I couldn't click fast enough! Now that my jaw is off the floor, congratulations! It looks like a wonderful book! Just preordered mine--congrats on a big accomplishment! Hi... Congrats on your 4th "Baby" :) I've been following your blog and read many posts in it. Its just great and very informative! Just curious to know whats meant by LDS?